On a recent Friday afternoon, I found my energy lacking as I attempted to transition between responsibilities and more personally rewarding pursuits. A pick-me-up was needed, and so naturally I went looking for a sandwich. Whole Foods happened to be conveniently located, and knowing that my esteemed colleague has found some good sandwiches there, I went to see what they had on offer. 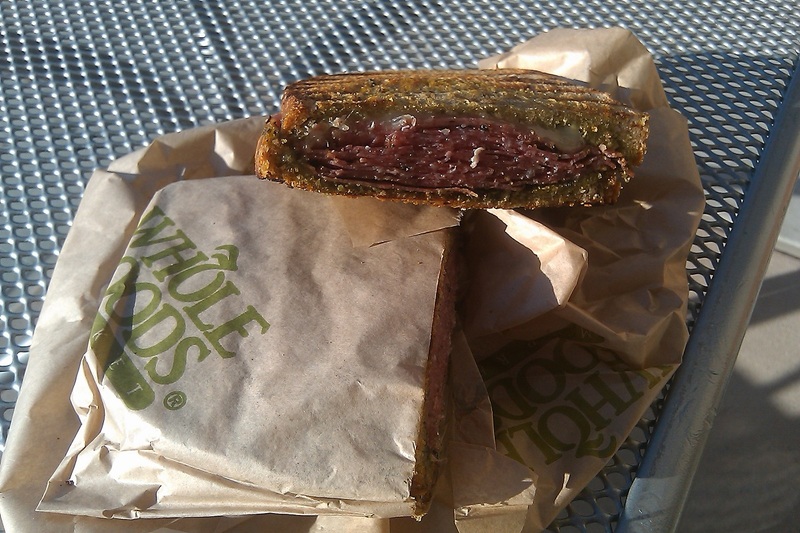 I found a sandwich of peppered salami, provolone cheese and pesto on “New York Rye,” which was then pressed in a standard sandwich press. It turned out to be just what I needed. The pesto was liberally applied to both the top and bottom slices of bread, giving that flavor the verve to stand up to the spice of the peppered salami. The meat to cheese ratio skewed heavily in the favor of meat, but better that than the alternative. (That’s my preference, of course, and if you prefer the other way that’s your business.) The press left things crisp and warm, and just like that I had started my weekend on the right note. This entry was posted in Sandwich Reviews and tagged Cold Cuts, Sandwiches I Have Eaten, Sandwiches Made For Me by Pete. Bookmark the permalink.